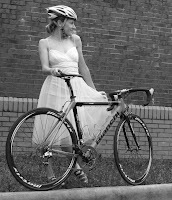 stickboybike: Dama Biancha-Lady in White. Dama Biancha or the Lady in White. Above is Evie of the BMW-Bianchi Elite Team. She just finished the build of her new whip for the race season. Sub-16lbs with SRAM Red, Lei Carbon T-Cube. ...you're about to get smoked by a woman in a dress!